Yellow wax pole beans (Phaseolus), also known as simple snap beans, grow on vines to a height of 5 to 6 feet. They produce an abundant crop of beans that have a reputation of storing well. Pods measure up to 8 inches in length and offer a crisp texture. The brilliant yellow coloration of the beans add color diversity in bean salads. Even after being cooked, the beans still retain their bright color. Plant yellow wax pole bean seeds in the spring after the soil temperature has raised above 55 degrees F. The beans can be sown indoors in peat pots four weeks before the last expected frost to attain an early harvest. Transplant promptly when the beans are no more than four weeks old because they do not tolerate transplanting well. Choose a grow site that offers well-draining soil because the bean plants will not tolerate saturated roots. Many gardeners prefer yellow wax pole beans because they grow vertically, which means they do not require as much garden space as bush bean varieties. 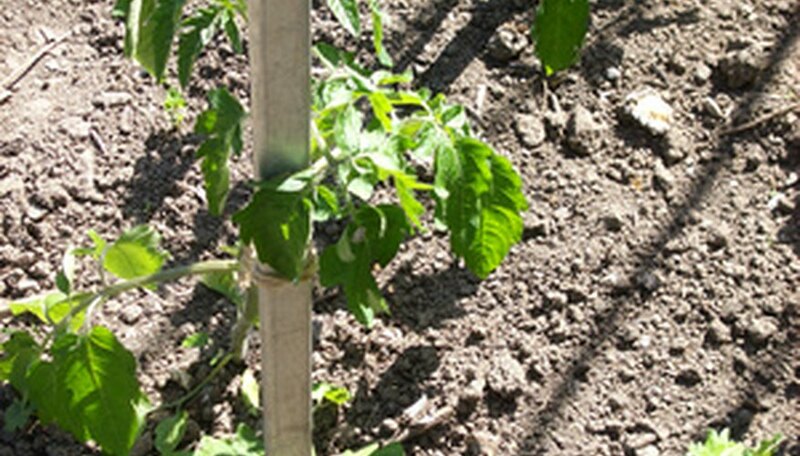 A trellis, string, stake or other climbing structure must be provided for pole beans. The plant prefers a soil pH of 6.0 to 6.8. Dig the soil to a depth of 8 inches to help the root system of the yellow wax pole bean to grow and establish. Mix ample organic material, such as aged manure, into the soil until it feels crumbly to the touch. Yellow wax pole beans belong to the legume plant family and they have the unique ability of fixing nitrogen into the soil with their root system. This ability means that the plant requires very little fertilizer to thrive. Plant the seeds of the yellow wax pole bean 1 1/2-inch deep. Plant eight beans in a circle beside the climbing structure that they will utilize to grow. Space seeds 3 inches apart for the best growth. Most yellow wax pole beans germinate easily and quickly with minimal care. Spreading a 1- to 2-inch layer of aged manure across the top of the soil after planting helps give the bean seeds a growing boost. Germination occurs six to 10 days after planting. Water the yellow wax pole bean plants once per year to a depth of 1 inch, because the plants do not tolerate drought well, according to the Purdue University. Always water the bean plants in the morning so the foliage dries out by night fall to prevent diseases from attacking the plant. Harvest the beans as they begin to swell in the pod. Gently pull the beans from the vine when harvesting so that the vine is not damaged. Regularly harvesting the beans will keep the plant producing until the first hard frost of fall.